KPMG, Prophet, ABB, Aecom, ICA, Lenovo, and Jacobs. Pretty random list of companies, right? There’s not much they have in common. Different industries. Different revenues. Different ways of operation. The thing all of them have in common is that they all plan projects. Isn’t that something all companies have in common? Might be. The common link here is that they do it with Ganttic. That’s the beauty of the planning software. Since it’s a resource-oriented project portfolio management tool, it isn’t industry specific. If it fits, it fits. Regardless of the type of your company. The ones that find Ganttic to be a good fit for them, are often the ones that are running away from spreadsheets or Microsoft Projects. The first being too uncomfortable to use and the latter being too complicated and expensive. Ganttic has made the basics of it as simple as it gets. Just drag and drop to schedule tasks and get going. Nevertheless, it still has enough depth to do detailed planning if you want to go there. One could say that it has the best parts of both worlds – scheduling tasks and project management. All smothered with a nice resource sauce. That’s the thing with projects, isn’t it? It always comes down to resources. Whether you are planning the release of a new cutting-edge software, building a website for a client, planning an event, managing a complicated engineering project or keeping an eye on a production line – in the end, it’s always about having to allocate resources effectively. It’s not even about the methodology you use. Agile. Kanban. Scrum. You choose. But you have to plan resources anyway. That’s why there’s a resource sauce in Ganttic. They present your resources in an all-inclusive resource view where all your different projects and tasks are brought together. That’s just the beginning, though. No one can get a good overview of everything pressed together. Luckily, the guys at Ganttic have gotten the hang of that as well. That’s why they give you countless ways to break that general resource view into bits that can actually be managed. One of the reasons why the resource planning software is a good choice for those that are planning multiple projects at once is that you can open each project up in a separate view. All the tasks you plan in that view are automatically connected to the project. You can still see all the other tasks that aren’t a part of the project to avoid booking a resource that’s already occupied with another project. The tasks that aren’t connected to the project that you have open are grayed out and on the background so you don’t have to hold a tiny orienteering championship to schedule a single task. Since all projects aren’t identical, you can customize each project view to your liking. You can add a filter that excludes all the resources that aren’t from a specific location. You can add a filter to exclude every other department but one. You can group resources using skills for a project that isn’t connected to a department or a location. You can categorize your resources almost infinitely with these magical things that they call custom data fields. You can combine multiple filters and groupings. You can order your resource by utilization to see which resources are free. Anything to spare your time. 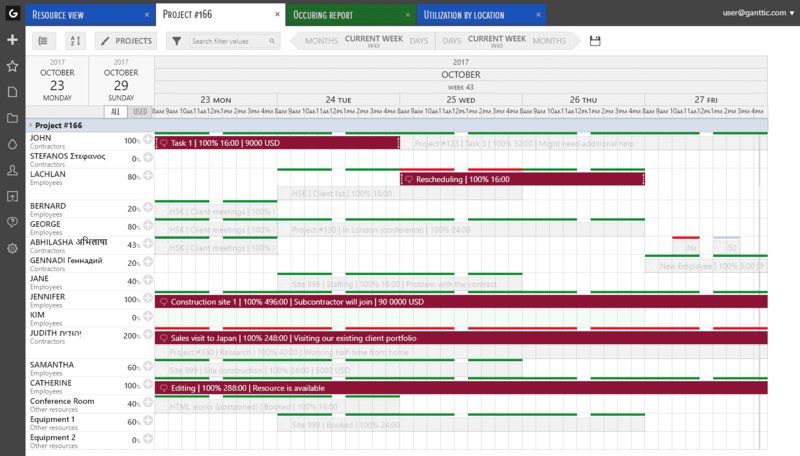 It’s not only projects that you can plan in a separate view. All those filtering and grouping options can be applied in general, too. 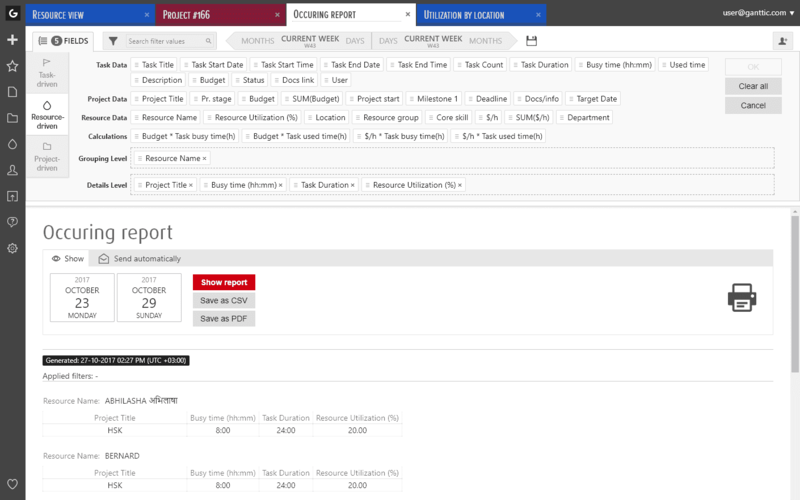 Which means you can create views for departments, locations etc that combine all the tasks and projects for that specific group. You change the time periods to zoom in on your plans or zoom out for that bird’s-eye view. Every time you change the time period, you’ll see that the utilization percentages of your resources will change. So you can check the utilization of your resources per day, per week or even per the whole year because no one knows better than you that you have to keep an eye on that utilization percentage in the short and long term. If that doesn’t satisfy your utilization planning needs, they also have capacity utilization graphs which indicate the combined utilization of concurrent tasks. You can use task utilization to prioritize tasks and then check the utilization graphs to make sure you are doing your math right. If you think summing up the utilization percentages is the only resource planning math that Ganttic can do, you are wrong. As said before, the mystical creatures that they call custom data fields can be used for grouping and filtering but also for calculating hourly rates in reports. And of course, if there are reports, it can’t be that you can only calculate hourly rates with them. You can also optimize your resource planning by calculating the differences between the amount of time you planned for the task and the amount of time it really took to complete it. You can calculate the number of business hours a project demanded from a resource. Anything you have planned, you can report. You can choose any fields in the combination that you need. And then send out the report automatically even to those that don’t use Ganttic. As you can tell by now, the amount of customizing you can do is pretty insane. Yeah, it’s the resource planning kind of insane which might not be the coolest of all the things that can be insane but it’s also the kind of insane that will make planning resources actually enjoyable. If you are the kind of person that loves creating systems and organizing makes you do a loud woohoo, there’s a lot for you to discover in Ganttic. Starting from the views and the filtering options and ending with custom color schemes you can create. You must really try hard to have a bad overview of who’s doing what if you customize the tool to fit your plans. However, if you are not the one for the schemes, you can plan resources without them, as said in the beginning. Either way, just go try it out, you’ll see for yourself. They offer a free 14-day trial. I like writing about stuff. Namely, things and methods that help us to control the chaos around us. I like work that's mindfully planned out and I like productivity that doesn't lead to burnout. I like software that's easy to use and gets me where I want to be. Oh, and I like cats and balancing stuff on my head.